HRaspirin means no more benefit invoices. We take the headaches away! Love our app? Have feedback? HRaspirin offers a variety of modes of transparency to assure that members and support personnel are up to date on premiums paid, premiums missed, and policy information. Consumers are looking for employers and insurance companies to provide them with the clarity to keep their plans in force. Hraspirin maintains security for its members. Every dollar is audited every quarter to maintain FDIC protections and HIPPA compliance. Cybersecurity is a growing problem with third party vendors and consumer data is targeted every day. Hraspirin maintains the lowest rating of security risk in the country while continuing to provide superior service to its customers. Employers will enjoy enriching their benefits programs without additional billing and paperwork. The cost savings to an employer can be substantial. Let you HR department get back to what they do best, managing your human collateral. HRaspirin will take care of the benefits administration! Carriers will have the option of utilizing HRaspirin as a third party vendor or, if they prefer a better concierge approach, they can private label HRaspirin to fit their needs. Carriers experience the highest persistency when policyholders have more information about their benefits and control over their premiums in a timely manner. 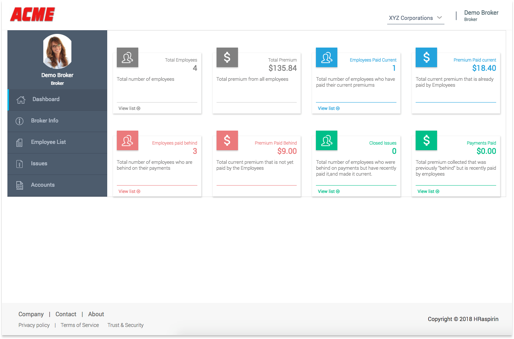 Human Resources accesses their own portal to stay up to date on premiums paid and past premiums collected. They can also review plan designs and add new plans for enrollment. We know employers want to offer a broad selection of benefits for their employees. They should not be punished with a pile of paperwork. Employees have the convenience of accessing their benefits on their mobile device. HRaspirin keeps them up-to-date on what benefits they have and what is available to them. They will receive messages concerning missed premiums. They will also be able facilitate filing their claims as well. Employees get their questions answered without asking their HR manager. Unions have difficulty accessing additional voluntary benefits for their members. Payroll deduction slots are often a negotiation. HRaspirin’s unique program accesses union members’ paychecks through a variety of different modes without negotiating for payroll deduction. Brokers have access to all their cases in HRaspirin. They can query individuals or groups to research a problem. Brokers can see who was paid behind and who caught up their premium. They will literally see retention of customers on their dashboard. 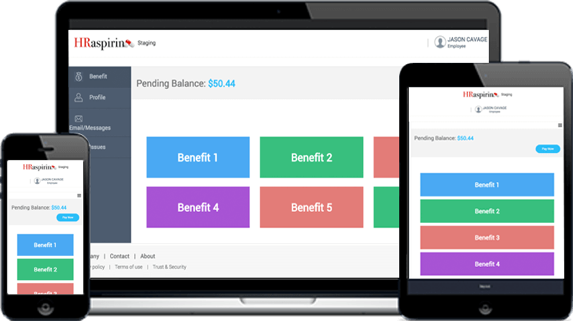 HRaspirin is a reconciliation platform designed to give multiple users access to premiums for their benefits. Hraspirin was founded in 2016 as a software company focused on solving unique problems for employers, special groups, carriers, and consumers. Please contact us with any questions or concerns.